For over forty years, the doctor’s teddy bear sat alone on his chair in the corner of the surgery. It seems unlikely but it’s true. It was a small enough room, the surgery that the doctor and the teddy shared. Just a desk and a rotating chair, a couch to lie-and-be-examined upon, a weighing scales, two chairs for patients and the extra chair in the corner that the teddy bear sat on. That was pretty much it. For over forty years, the doctor and his bear had seen all of the thousands of patients who had come and gone. The infantile and the elderly, the genuine and the fakers alike. They had given their ear equally to all. After the first few months, the doctor did not even know that the bear existed. Even when a child came in and picked it up to play with it, the doctor was always too focused on the matter in hand to remark on his career companion serving his purpose. For this indeed was his purpose, to distract and entertain the sickly children when they came to be seen. Back in the earliest days, the doctor’s wife had quietly remarked on the austere conditions in her husband’s surgery and so had bought the bear in a second hand shop in a nearby town. She had put him sitting on the spare chair one afternoon and the doctor has raised an eyebrow at her and she had shrugged in return and that was it. The bear was in. Shop bears do not have any feelings, of course. Those bears who sit on shelves and wait to be bought are nothing more than what they may seem to be. A stitched-together collation of cotton wool and fake fur, of glassy eyes and scrap-fabric-scarves. They have no sentiency. They have no feeling. But the doctor’s teddy bear was a different matter entirely. Before it had ended up in the second hand shop, and before the doctor’s wife had found it, the bear had been a beloved toy to a succession of brothers and sisters in the house of a large rural family. As we all know, the constant handling, caressing and affection bestowed by a child effects a change on the soulless store-bought toy. The particles of skin and hair, the molecules of humanity, not to mention the warmth of emotion that is bestowed, all of these things instil a modicum of life and knowledge into a toy. It doesn’t show itself in any visible way. Of course not, how could it? But it is there nonetheless, a spark of something. And the doctor’s teddy bear had soaked up more life than most. 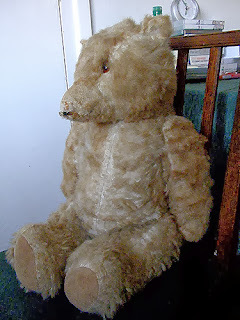 Years upon years of hugs and care and night time saliva kisses had left the bear with a vibrant hum of life about it. An ability to taste its surroundings. A dubious talent for feeling warmth or lack of it. And this was a dubious talent indeed for, ever since the old woman had died and it had gone to the second hand shop, there had been a pronounced lack of warmth in the low wattage life of the doctor’s teddy bear. Mostly the bear was dormant, untouched save for a brief lift from the cleaner when she came in on Tuesday nights to make her sweep of the surgery. Like the doctor, the regular children had become impartial to the presence of the bear. Nobody touched it, nobody saw it. It sat and witnessed the comings and goings of the day and the unremitting darkness of the long nights. Today was no different beyond the fact that it was the end of days. The doctor was to see his last patient today and then he would retire to a life of gardening and golf and leisurely breakfasts. He had been on call to his country clientele, day and night, for the best part of his life and he deserved the early release. Most of the paraphernalia of the surgery had been removed and boxed up. The incoming doctor had a new surgery. This place would fall to cobwebs and dust over the coming years, It had nothing more to do. His daughter had come to help him on this last day. There would be a steady stream of people in to the surgery, very few of them sick. They would come to pay their respects, leave a bottle of amber liquid, wish well and shuffle away. There was a dinner planned for the evening, just family and a few close friends. The doctor looked up over the top of his reading glasses and, for the first time in decades, he gave some of his attention to his teddy bear. The bear felt the warmth generated by his gaze. The bear felt little. Just the faintest sense of the earlier heat drifting away. The daughter lifted the bear and tossed him into a black plastic rubbish sack, along with the health posters from the walls and the broken stethoscopes, then she took the bag and left it out for the bin men. The bin men come early in these country parts. At 5.30 am, on the morning after his retirement dinner, they pulled up outside the doctors front garden and started to throw the black bags onto the back of their wagon. It was more rubbish that they would normally accept but most of them owed some debt to the doctor so they didn’t grumble. The doctor heard the hiss of the bin lorry’s hydraulic breaks and he sat up in his bed. He looked at the cold place where his wife had lain for so many years and he shook his head to clear it. He bolted down the stairs and shouted at the bin men to wait, wait. There was only one bag left, it dangled in the hand of the oldest bin man, himself overdue for retirement. The doctor snatched the bag from the bemused bin man and tore it open. Health posters, an old stethoscope… there he was, impervious as ever, the old bear. The doctor stood at his front gate in the early morning mist and he looked at the bear and the bear, in his own subtle way, looked back at him. Then they went inside to breakfast. Wasn’t sure how this one was going to play out—was the bear going to come to life and reprimand the old man?—but the ending resonated with me. There are too many things I’ve tossed in moments of righteous indignation that I now bitterly regret having parted with. Sentimental attachment is an odd thing, the way we attribute meaning to inanimate objects or the way we make places or pieces of music our own. I have no idea what happened to my old teddy bear. I know he lost an eye and once we were older my brother and I used to hang him from his neck from the loft door and use him as a punching bag which, and this is the point I was making, fills me with a sense of shame. Why on earth should that be? I’m pretty sure my daughter still has all the soft toys I bought her apart from the big pink elephant which I last saw in my mother’s coal bunker. Huge thing it was. I still have the photos of her sleeping propped up beside him so all was not lost. Lovely stuff! Wish I'd found this blog sooner. I love a happy ending. Had a little tear. Named my first bear after my grandad so I had his hugs wherever I went. It sadly fell apart after 30 yrs.